What's this? A listing for an unreleased Intel chip on eBay? This purported eight-core, hyper-threaded Sandy Bridge E-series processor is apparently a third party tester unit, hence the cloak and dagger "Intel Confidential" stamped in the middle of the thing. The "E" in the series, as previously stated, stands for "Enthusiast," especially fitting in the case of a $1,360 dollar piece of near-future tech with a strict no refund / return policy. Not surprisingly, the sale has been shutdown prematurely. 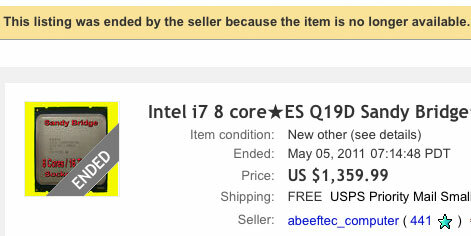 Whether it was pulled by the seller or at the strong urging of Intel will have to remain a mystery for now, as will those blazingly fast speeds we've read so much about -- at least until it pops up again on Craigslist. Update: To be clear, the "ES" on the chip stands for "Engineering Sample" but the "E" in the series name stands for "Enthusiast."